Blessings to you All, and welcome back from your break. I know that I was able to relax more deeply into this process, and I hope that all of you were able to relax into this new higher-dimensional version of yourself that you are awakening within this One of the Now. In preparation for your throat chakra, which is the first portal into your higher dimensional self, let us take a moment and go back down to the beginning to your first chakra. Now that you are opening your fifth chakra, and you will be able to move into higher realms of reality, we suggest that you take a long moment to deeply ground your first chakra - down, down, down, down into the core of Gaia. Connect that You into Gaia’s central crystal. Now rising up, up, up into your first chakra, move into your second chakra, which you’ve also loved unconditionally, and allow your emotional body to become more adult and to heal that wounded child and bring him or her into the Light of your daily life. For what was learned as a child is vital for your adulthood because your child remembers your mission, and far too often that mission that we chose to take before we took this body is forgotten by the time we are adults. Now revisiting that third chakra of our inner power and power over/power within – and we have chosen Power Within. For with that Power Within, we are able to embrace the new frequencies of Light that are coming increasingly into our reality. Now expanding that Power within into our heart chakra, which we have so expanded and so settled into during our break. Now we move into the fifth chakra. And, the fifth chakra is our portal into the higher dimensions. And, our fifth chakra rules our clairvoyance - our ability to hear the higher voice. It also rules our physical hearing and our physical communications. So as we move into this fifth chakra, and we send this fifth chakra our Unconditional Love, we also share that Violet Fire to blaze, blaze, blaze all shadow of all the fearful thoughts, feelings, emotions that were not expressed, and they will not need to be expressed because we have now blazed them with the Violet Fire transmuting them into Light, Light, Light. For within this chakra, we are able to look through one portal to see our Heart and all of our lower chakras, as well as open that higher portal to receiver our Higher messages via our clairaudience and connect us with the higher components of our self that can perceive the clairsentience of that which see. Now, as we take a moment while still feeling the Heart chakra, we connect our fifth chakra, our throat chakra with our fourth chakra, our heart chakra. For our heart chakra is in continual communication with all of the workings of our physical body. And, as we move more deeply into this Higher Light, our innate abilities to read, speak, hear and share Light Language will greatly expand, and we will feel much of this Light Language within our physical body within our physical heart and within our lower chakras as well. So we are able to take all of this information – non-verbal information, largely emotional or tactile information that we have received from our body and we contribute it to our fifth chakra. And, our fifth chakra has the ability to translate this non-verbal information into conscious thoughts, emotions, writings, pictures and all forms of conscious sharing of our experience. And it is with this enlivening, with the Unconditional Love that we share that has been shared with all of our bodies so far, and we expand it into our throat chakra, we can use this Unconditional Love to discern these higher messages. For Unconditional Love knows Unconditional Love and Unconditional Love knows deception. And as we listen to this message that we send, we are able to bring it in to the clairaudience abilities of our fifth chakra so that we are able to translate these higher dimensional messages into the spoken language of our daily life. It is through this fifth chakra that we are able to discern –is this a real reality? Our fifth chakra, which is ruled by our thyroid gland, is able to move through massive amounts of information and discern the information that is important for our healing, for our further education, for our further inter-dimensional and multi-dimensional education. And is this information something that we can bring into the other chakras so that we can maintain a state of healing and awakening to the higher frequencies of Light that are moving into our bodies and into our system? So now we ask that you take a long slow deep breath and breathe right into your throat and feel how this throat, this portal can hear that which your physical ears may not be able to perceive. So listen, not with your physical ears but with the expanded communication abilities of your throat chakra. Now to prepare your throat chakra for this ability, be sure to send it Unconditional Love. And while you’re sending it Unconditional Love send your self Unconditional Forgiveness for all that you thought you should have done, for all that you did not do and Unconditional Acceptance that whatever has occurred so far within your life is a component of your own birth plan that you wrote for yourself. Perhaps it has felt harsh. But when you wrote this birth plan, you knew that you wanted to Ascend into your Light body in this particular incarnation. And you knew that you would have the ability to find a way to Unconditionally Love yourself and to use this great power of Unconditional Love for yourself so that you can take the challenge to move through situations that before you would have thought too challenging, to frightening. But now you are in communication with your Higher Self. Now, you can see the pathway in between - in between that which perhaps you should have done – in between that which you don’t want to do. “I am ready to walk this path. I am ready to take these challenges. Now allow yourself to hold that sentence, to hold that decree within your heart. And, allow that decree to share itself with everything that you hear, with everything that you say. Allow that decree that You are Ready to fulfill the contract that you wrote before you took this incarnation. You can feel the great courage that you had when you wrote it. Now to prepare your throat chakra for this ability, be sure to send it Unconditional Love. And while you’re sending it Unconditional Love, send yourself Unconditional Forgiveness for all that you thought you should have done or that you did not do and Unconditional Conditional acceptance that whatever has occurred so far in your life is a component of your own birth plan that you wrote for yourself. Perhaps it has felt harsh, but when you wrote this birth plan you knew that you wanted to Ascend into your Light body in this particular incarnation. You knew that you would have the ability to find a way to Unconditionally Love Yourself and to use this great power of Unconditional Love for Yourself so that you can take the challenge to move thru situations that before you would have thought too challenging, to frightening. But now you are in communication with your Higher Self. Now, you can see the pathway in between – in between perhaps that which you should have done, in between that which you don’t want to do. “I am ready to walk this path. I am ready to take these challenges. Now allow yourself to hold that sentence, to hold that decree within your heart. And allow that decree to share itself with everything that you hear, with everything that you say. When you wrote this contract You were your higher-dimensional self. So as you open this fifth chakra and fill it with your Unconditional Love, bring in your clairaudience. Bring in your ability to commune and communicate with your own Higher Expression of Self. Now, remember if you wished to meet with someone on a regular basis you would make an appointment time. You would create an appointment place and you would document that appointment. I promise you, my higher expression of self- that I will document this information so that it is grounded into the body of Gaia. And as I document this information, I also promise that I will use my voice, my Higher Voice, either through my words or my singing, through my writing, through my art – through all my expressions of my creativity. I will share this information with others. I am Important. What I have to share is important. I know that because I hear my Higher Self reminding me that I am Important. Blessings – blessings to me. I Love Myself Unconditionally. LOCATION: The location of the fifth chakra is in our throat. PETALS: This chakra rules creativity and is the first chakra where we can become in touch with higher beings. The Throat Chakra has sixteen petals. In numerology, a number 16 reduces to a 7. Seven is the number of analysis, understanding, knowledge, awareness and meditating. The number 7 directs an inner focus that is vital for creativity to germinate and to communicate our deepest, honest self with others and with higher beings. The challenge of the number 7 lies in the difficulties brought on by discomfort with our inner feelings, which cannot be expressed. The number 7 urges us to go inside and join our thoughts and emotions to find a creative expression. NOTES AND MANTRA: The note for the fifth chakra is G# and the mantra is “ham” or “u” as in blue. COLOR: The color for this chakra is pale blue or a greenish blue. grace and listening to the Higher Self. This chakra urges us to find our “self,” communicate it through our creativity, and use the creative force of our higher emotions to move our consciousness into the higher dimensions. SENSE: The fifth chakra rules the sense of hearing. Just as we must learn to hear our inner self, we must also learn to “hear” others. ASTROLOGICAL SIGN: Gemini, and its ruler Mercury, focuses on communication. Many people with their Sun in Gemini enjoy performing and other means of creative communication. Geminis are also very analytical. Their dual nature makes them very gregarious and, at the same time, quite reclusive. ELEMENT: The ether is the element of this chakra. The fifth chakra is the first chakra that is ruled by our higher senses, which calls for the force of this chakra to focus on the members of the Angelic Realm. CONSCIOUSNESS: The fifth chakra directs our attention towards the higher third and fourth dimensions. It is still ruled largely by our conscious mind, but has access to the collective consciousness. When this chakra is balanced, our individual consciousness has progressed beyond personal and group consciousness to “national consciousness”. PERSONAL TIMELINE: This chakra represents the stage of life of adulthood. At this stage, a sense of self is established enough so that we are fully responsible and can build long-term relationships. If we can use the power of this chakra, we can learn to go inside of ourselves to determine the source of our emotions. Then we can effectively communicate our personal experience to another. It is the ability to go inside to connect with our inner guidance before we communicate with another that creates true intimacy because it is based on our deepest inner truth. SOCIAL TIMELINE: The time era best represented by the Throat Chakra is the New Age—our present time. In this era it is our challenge to shift from national focus to planetary focus. This collective consciousness urges the individuals in “national consciousness” to expand their consciousness. In order to face the challenges that lay ahead of us, like pollution and the ability to end life as we know it with a nuclear war, it is time we realize that all of us are in this world together. We are presently faced with many challenges that we could never even conceive of in the past. We must all go inside and call upon our highest guidance so that we can honestly, effectively and creatively express our solutions. Worship through this chakra has expanded beyond the one male God with human characteristics of anger and revenge, who safely lives far away in heaven to a concept of God that encompass both the masculine and feminine polarities as well as all of creation: God/Goddess/All That Is. ENDOCRINE GLAND: The endocrine gland for this chakra is the thyroid gland. The thyroid is a butterfly shaped gland which wraps around the front part of the windpipe just below the Adam’s apple. It produces hormones, which influence essentially every organ, every tissue and every cell in the body. Thyroid hormones regulate the body’s metabolism and organ function, affecting heart rate, cholesterol level, body weight, energy level, muscle strength, skin condition, menstrual regularity, memory and many other conditions. In other words, our thyroid communicates with our entire body and has much to do with regulating our overall health and well-being. NERVE PLEXUS: The nerve plexus for this chakra is the laryngeal plexus. This plexus controls our throat, shoulders, arms and voice. CLEAR: When this chakra is clear we have good communication, expression, creativity, inspiration, and positive interactions with others. Our metabolism is healthy, our cholesterol levels are good, we have vital energy and we feel strong physically and psychologically. We are inspired to express our higher self and have a life enriched by creative expression and entertainment. Our relationships are based on truthful communication and true intimacy. UNCLEAR: When our fifth chakra is unclear we often have hearing problems, throat and/or voice problems, coughing, stuttering, poor metabolism, thyroid gland problems and the flu. We feel unfulfilled creatively and may be bored and boring. We may have problems speaking too loud or fear of speaking out. Our relationships may suffer from poor communication and a lack of intimacy. We feel uninspired and disconnected from our spiritual guidance. EARTH CHAKRA: Mother Earth’s fifth chakra is in Mt. Shasta, California. Mt. Shasta has long been known as a spiritual vortex and many retreats and seminars have been held there. Metaphysically, the ancient Lemurians are said to have been living in the fourth dimension of the area underneath Mt. Shasta. Mt. Shasta is the highest mountain in the United States and is a pinnacle of inspiration. DIMENSIONS: The Throat Chakra rules the higher third and fourth dimension. Our tortured emotions can pull us into the nightmare of the Lower Astral Plane. Therefore, before any of us can begin our inner travels through the inner planes of reality; we must clear a “tunnel” through our own dark side that lies in the Netherworld of the Lower Astral. Once we have accomplished that, we have opened our consciousness to a wondrous inner world that is as real, in fact more real, than the world of illusions that is our physical reality. SUMMARY: The Throat Chakra is the first step towards acknowledging that we are all Gods and Goddesses in training. Like a small seed dropping from a flower, we come to the third dimension to learn to grow into our own flower. We find many hardships, as often the soil is dry and unfertile. However, it is through facing our inner and outer conflicts that we grow into our higher creative self. Our personal creativity is not limited to what is socially identified as an art form. Every area of our life demands communication of our creative force. How difficult is it to find a way to lovingly guide a small child or deal with a dogmatic employer? Many people may say, “I am not creative.” Nothing could be further from the truth! Our Throat Chakra holds the force of creative expression that is our birthright. Everyone is creative. If we have lost our connection to our creative SELF, it is one of the greatest losses we can suffer. But of course, how can we lose our inner self? We cannot! The door to our inner self is ALWAYS accessible. It is only our own unhealed pain and fear that shuts and locks the door. If we cannot open that door, then our first action must be to find someone who can help us to communicate with the SELF that waits within each and every one of us. 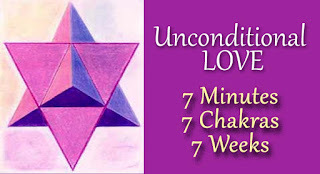 New to the Unconditional Love 7 Minutes ~ 7 Chakras ~ 7 Weeks process? How was your week off? Were you able to integrate the unconditional love you've received thus far? I have not been able to do the other 4 meditations. Is it ok if I do all 5 on the same day for one week or should I do one chakra for a week starting from 1st chakra meditation. This is your process and you can do it any way that feel best for you. Thank you so much for the wonderful meditation. It resonates greatly. Great empowerment! High Gratitude for this incredible path of Self Expansion! Infinite blessings!!! It will be a challenge for me to express the right words. Words filled with love, purity and of a high vibrational quality. To see and acknowledge the teacher that I am. You are helping me with that. tears where running by hearing your Meditation about the 5. Chakra………….. I'll hear it again………… have a very heavy heart today…………. The night from Sunday to Monday was one of the most challenging I ever had. A dream came to me that reminded me of old undigested situations. It kept my awake the rest of the night and all this situations ran trough my mind without any rest. All that time I blase the Violet Fire and sent Unconditional Love to my self. It reminded my to let go for good and all this situations, persons and fearful thoughts. And it reminded my first of all, that I am just responsible for my own perceptions and never for the ones from others. I am the only one in my world that creates my world simply with this perceptions. With this state of consciousness I can easily heal my past and future. Now in the process of sending Unconditional Love into my Throat Chakra a deep calm flows through me again. This is very magic. If I send Love in my throat my perceptions shift to my power within in no time. In my perception the throat has a direct connection with the Solar Plexus. Symmetrical and mirrow-inverted this connections continue like this: Third Eye~Sexual Chakra and Krone Chakra~Basis Chakra and so on with the higher Chakras. If I could paint this in a multidimensional way it would look like the rings in the water of a quite lake in which I through stone by stone every time in the center of the last ring. The center impulse comes always from the heart. Al in all it looks like a huge rainbow bowl. Beautiful! And every feeling being has it around like its own “planetary system”. In this manner I can feel how sending love into the higher realms of my Throat parallel heals and brings forward the undertones of my Solar Plexus. Please share your perceptions as to that. Note: If I send Love in my throat also my external focus shifts into my internal focus in no time. How timely Susan, Thank you! Thank you so much for the posting unique content. for getting more ideas about the same. Yes, there are small portions of multidimensional light in us and once we have exercised physically, we can see our light quotient or some light more clearly (when eyes are closed) after exercise. There are small or very small portions of multidimensional light in us and we may see our own more clearly (when eyes are closed) after physical exercise/meditation.